USS Holland (AS-32) was the second Hunley class submarine tender and the third Holland named in honor of John P. Holland, who built the first submarine commissioned by the Navy. USS Holland was commissioned on September 7, 1963 in Charleston, South Carolina. Built a Fleet Ballistic Missile Submarine Tender, the USS Holland's mission was to service submarines, replenish food supply, fuel and weapons and she was equipped with a machine shop for repairs. Her first major mission started in 1964, lasting two years, in Rota, Spain where she took over for U.S.S. Proteus, restocking missiles and supplies to the Polaris Submarines. 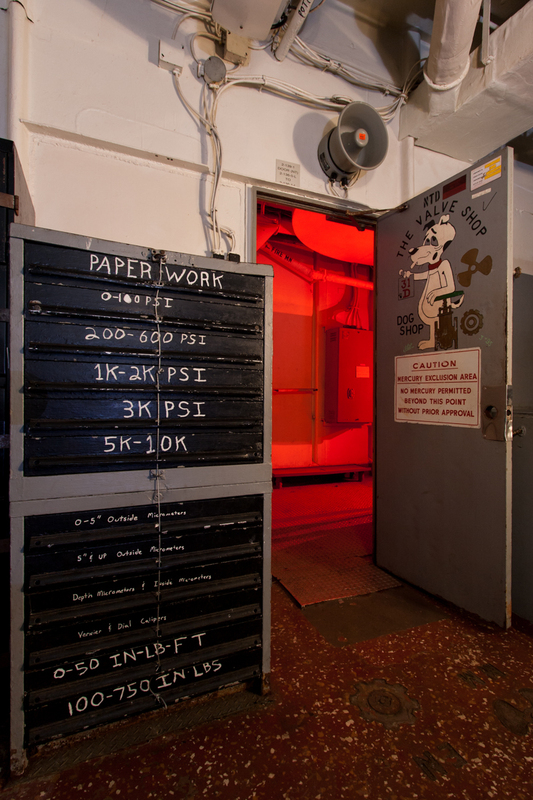 In 1968, she received her first overhaul known as the ‘Nuclear Facilities,’ in Bremerton. It was and was completed in between 1968-1969 after the ship left the shipyard in Charleston, South Carolina. 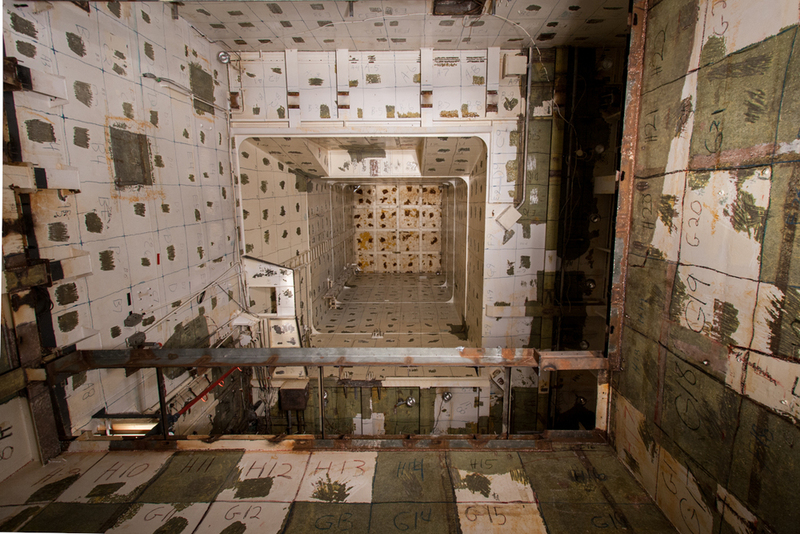 This gaping space lies in between the two cargo cranes, spanning from the hull of the ship to the 02 level. The tender would collect the contaminated water from the submarines she was tendering and recycle it here in this large space. 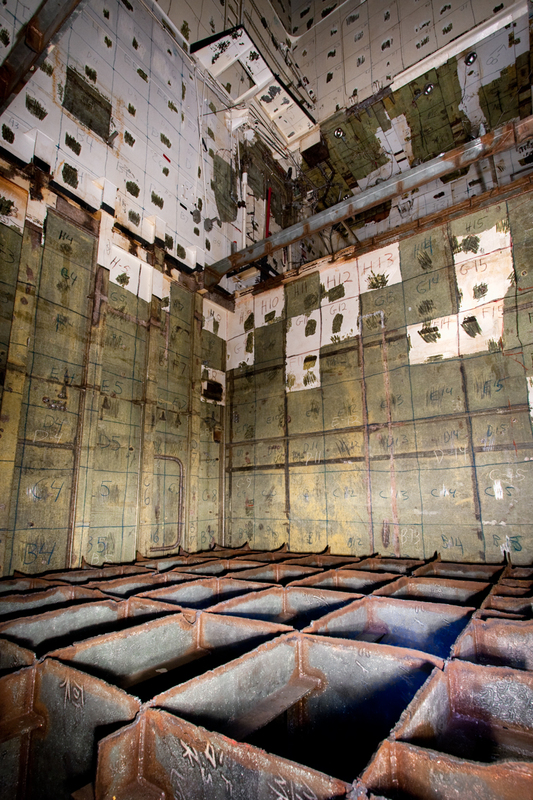 The metal configuration at the bottom of this space would have supported a deck, however, during the radiation testing process, it’s likely contamination was found, causing it to be removed. After a few modifications in the United States, U.S.S. Holland set sail from Charleston, South Carolina (known as Site Four) to Holly Loch, Scotland. There, the ship added a few new crew members, including Jose Garcia, who shared with me the ship’s unpublished history, the crew’s stories. Jose Garcia was a crane operator/deck force/weapons handler on U.S.S. Holland from 1975-1977. A typical day for Jose and the crew started at 0800 with a deck call, where they would be read the ‘Time of the Day’ and receive the day’s assignments. Though many of the crews’ tasks were strenuous, dangerous and mundane, it paid off to complete the work well and in a timely manner so they remained in good standing with the officer. If they were lucky, they would be assigned a more desirable position, like Jose’s favorite job, crane operator. 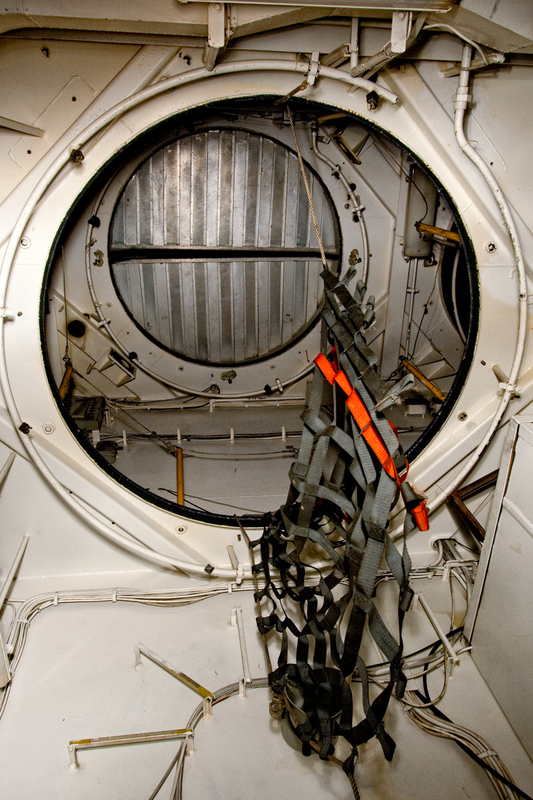 Other crew duties included preventative maintenance tasks, such as painting the deck. But there were also higher priority duties, including transferring missiles and supplies to the submarines as well as changing their batteries, which was no easy task. Each battery weighed just over 1,600 pounds and had to be stored in acid proof tanks, to prevent damage if a leak occurred. Daily maintenance was required to prevent dangers, such as the effects of batteries coming into contact with salt water. During Jose’s time aboard U.S.S. Holland, it wasn’t uncommon to see a few submarines docked alongside the ship, especially in the evenings. While they were relaxing, the crew often participated in less than acceptable activities, during which they were forced to be cautious in order to avoid getting caught while "secretly making moonshine in the engine room," or “smoking hash like crazy” in the Aft Engine room. Despite the fact that the crew enjoyed moments of laughter aboard the ship, moments of hardship did occur. Being confined to such tight ship quarters caused tempers to flare, which occasionally presented issues between crewmembers. If the crew were on duty while the ship was in port, they would remain aboard the ship and spend the night in a bunk. However, at the end of many days a handful of crew members, including Jose, were given liberty, a chance to rest their ‘sea legs.’ In Jose’s case, he was able to return to his own apartment in Scotland. U.S.S. Holland was outfitted with two different types of missiles, the Polaris and the Poseidon. In the 1960's, she received a modification removing the Polaris missile magazine, replacing it with a prefabricated, 250-ton Poseidon Magazine. 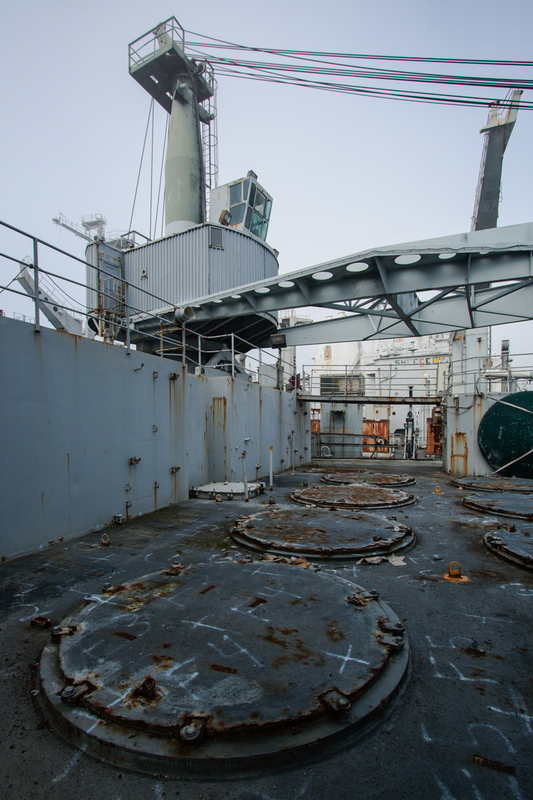 She had sixteen main deck hatches allowing access to the magazine storage, which I had passed earlier in the day. 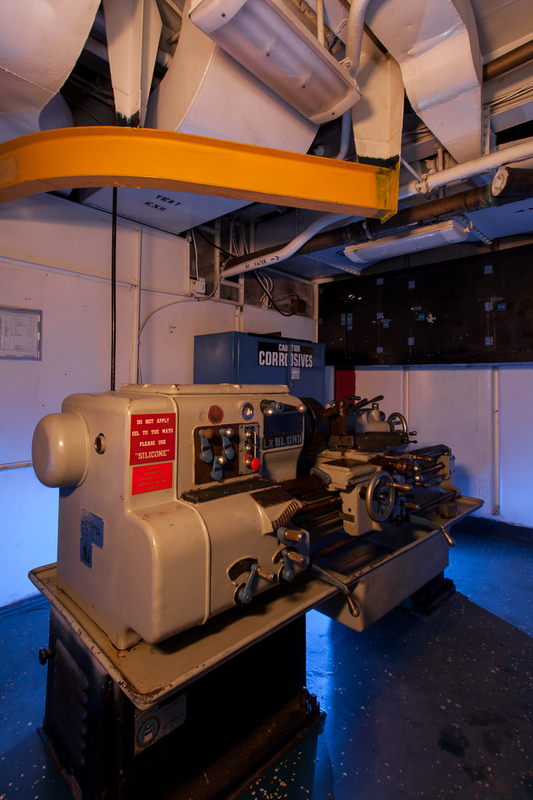 One of the twin 30-ton cranes located above the hatches would pull the missiles from the magazine storage to the main deck for transfer to the submarines. U.S.S. Holland supported Poseidon missiles until she was decommissioned. In early 1992, U.S.S. Holland underwent a conversion overhaul, outfitting her for the necessities to support Fast Attack Submarines. Later that same year, in July, U.S.S. Holland assumed full duties in Guam. Unlike many years prior, her last four years in service were spent at sea. 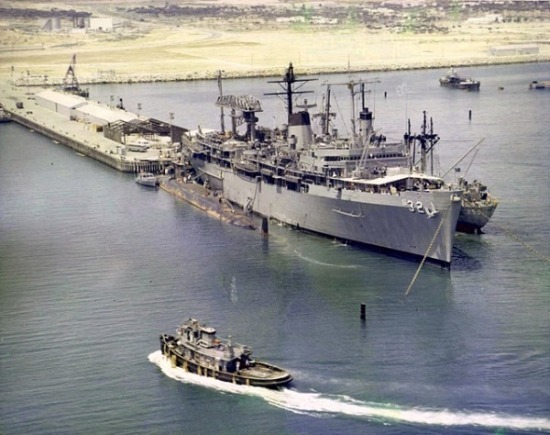 She was decommissioned on April 13, 1996 in Apra Harbor, Guam, after which, she was transported to Washington for two years, where she was stripped down and checked for contaminants. In May of 2000, she was sent to the National Defense Reserve Fleet in Suisun Bay, California. Garcia, Jose. Telephone Interview. 6 July 2009.